Los Angeles, CA (April 16, 2018) – The 16th annual Indian Film Festival of Los Angeles (IFFLA) concluded on Sunday evening (April 15) with a red carpet and gala that featured the Los Angeles premiere and official HFPA screening of Rima Das’ "Village Rockstars", one of the most lauded Indian films on the festival circuit, which also just took home four top awards at the National Film Awards in India, including Best Feature Film. IFFLA’s screening of the film was also selected by the Hollywood Foreign Press Association as a Golden Globes-qualifying screening. The evening also featured the presentation of the festival’s Grand Jury and Audience Choice Awards presented by HBO. The audiences at this year’s IFFLA chose "Take Off" directed by Mahesh Narayanan as their favorite narrative feature film of the festival. "Lovesick", directed by Priya Giri Desai and Ann S. Kim took the Audience Award for Best Documentary, and "An Essat Of The Rain" directed by Nagraj Manjule was chosen as Best Short. IFFLA is widely recognized as the premiere showcase of groundbreaking Indian cinema globally. The 16th annual Indian Film Festival of Los Angeles (IFFLA) took place April 11-15, 2018 at Regal L.A. LIVE: A Barco Innovation Center in Los Angeles, California. This year the festival featured four world premieres, three North American premieres, two U.S. premieres, and 14 Los Angeles premieres. The lineup represented an impressive 12 languages and a strong list of first and second time filmmakers, including 11 female filmmakers. Now in its 16th year, the Indian Film Festival of Los Angeles (IFFLA) is a nonprofit organization devoted to a greater appreciation of Indian cinema and culture by showcasing films and promoting the diverse perspectives of the Indian diaspora. The five-day festival is the premiere platform for the latest in cutting-edge global Indian cinema and bridges the gap between the two largest entertainment industries in the world – Hollywood and India. 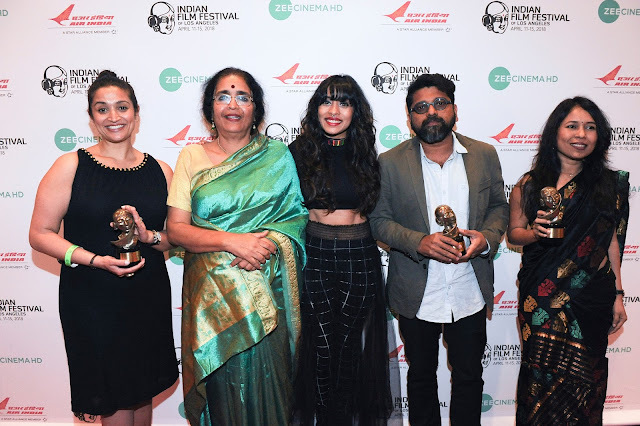 The festival showcases more than 25 films from the Indian filmmaking community across the globe, hosts the highly anticipated Opening and Closing red carpet Galas, and the Closing Awards ceremony.